These young women graduated from Marshall High School in June 2011. Jones College Prep, a selective enrollment high school ranked No. 1, and Urban Prep, a charter high school for African-American boys, ranked No. 2 in the percentage of 2011 graduates enrolling in college. In previous years, Urban Prep has claimed 100 percent of its grads were admitted to college, only to see official figures for college enrollment from the National Student Clearinghouse come in much lower – 76 percent for 2010. This year is different, with Clearinghouse data yielding 91 percent. 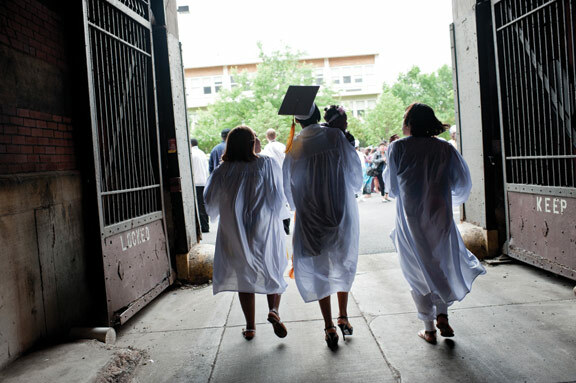 Overall, nearly 60 percent of 2011 CPS graduates enrolled in college last fall, up from 56 percent in 2010, according to Clearinghouse data CPS quietly posted on its post-secondary website. Black and Latino males continue to trail other groups, but both saw increases of 5 percentage points. CPS’ college enrollment rate is nearing that of the national average, which in 2008 was 63 percent, according to Tom Mortenson, senior scholar at The Pell Institute for the Study of Opportunity in Higher Education in Washington and an independent higher-education policy analyst living in Oskaloosa, Iowa. College enrollment rates have been stagnant across the nation, except for low-income students, who have increasingly enrolled in college, he says. Mortenson previously worked for the Illinois State Scholarship Commission and says the improvement in Chicago is remarkable. “To see Chicago go from a hopeless situation to a place where there is progress being made is one of the miracles of my lifetime,” he says. At 55 percent, neighborhood high schools continued to post the lowest college-enrollment rates among all types of schools, but they saw the biggest jump — about 3.4 percent. The city’s five turnaround high schools—Orr, Marshall, Harper, Fenger and Phillips—saw a slight decrease and continued to have some of the lowest rates in the district, from an average of 43 percent to 42 percent. In 2008 and 2009, these high schools had their entire staffs revamped and received substantial district and federal investments. Urban Prep’s increase in college enrollment drove a 1 percentage point jump for charter schools as a whole. Perspectives-Calumet, Noble Street’s main campus, and ACE Charter School in Garfield Park saw sizeable increases of more than 10 percent. The two high schools run by Aspira were the only charters that enrolled just half of their graduates. For the most part, the data are a testament to the Arne Duncan administration. The current CPS leadership was just coming into office when the Class of 2011 was graduating and packing their bags for college. Duncan’s team, led by Greg Darnieder, sought, for the first time, to find out how many CPS grads enrolled in college. When the numbers first came in, in 2004, they were shocked: Only 43 percent of grads had made that transition to higher education. They responded with a number of initiatives. For example: Holding principals accountable for getting each student to fill out financial aid forms and apply to colleges, and giving high schools college coaches to help students choose and follow through. With up to 350 students each, regular counselors had little time for this. They have taken these initiatives to Washington D.C. and currently have a pilot program in several states to track financial aid completion rates. Experts say providing schools data that showed which students had completed financial aid forms is key. “This undoubtedly changed the conversation for us,” says Kim Cook, executive director of the National College Access Network. Also, she says her agency and several not-for-profit agencies have taken up the work of college coaches and are partnering with schools to provide extra support for college counselors. On Tuesday, CPS officials announced that CPS 2012 graduates were awarded nearly $276 million in scholarships, up from $147 million in 2011. Liz Monge-Pacheco, the post-secondary coach for the Network for College Success, says that this year, the district has been good about trying to pull together the data on scholarships. However, she points out that students might be awarded multiple scholarships at different schools and will often not be able to use all that is given to them. Monge-Pacheco works closely with the post-secondary teams in six schools and she says that the environment has gotten harder for students to find money for college. One of the biggest challenges came this year when the Pell Grant adjusted its income requirements, making it harder for students to qualify for the full award. “That made a difference for some of our students from choosing a four-year university vs. a two year,” she says. Further, it is unclear what the current CPS administration plans to do to keep the college enrollment numbers rising. The centralized post-secondary office, which included specialists who worked with school teams, has now been whittled down to just a few people. Some network offices have post-secondary specialists, but still Monge-Pacheco says people are wondering who will help organize college tours and help individual schools navigate the process. As part of its effort to close a huge budget gap, the district office told schools that if they want to keep their college coach, they will have to cover the cost completely with discretionary funds. Previously, central office chipped in. Chief Administrative Officer Tim Cawley balked at the expense, saying he doesn’t understand why CPS would pay for coaches who aren’t certified counselors. The coaches were in addition to counselors, who often are responsible for a host of tasks including organizing graduation, assessments and crisis intervention. Some principals have chosen to keep their college coach. Dunbar High School on the Near South Side saw their college enroll rate rise from about 50 percent to nearly 68 percent—the biggest increase among neighborhood high schools. James Gorham is the director of Dunbar’s post-secondary department, a unit created when Camilla Covington started as principal two years ago. Gorham says he was hired as a college coach. While he does not have a counseling degree, he does hold a bachelor’s degree in psychology and has experience working with teens. Last year, CPS covered half his salary. Gorham says he requires seniors to submit six college applications: two to schools that they could easily get into; two that have their major and that, given ACT and GPA scores, they could probably get into; and two “reach” schools. He also has seniors fill out at least three scholarship applications and the federal financial aid form. Gorham and his team also follow up with students over the summer, making sure that they actually enroll in college and get themselves there. When Darnieder began collecting college enrollment information, one revelation was that there was a big disconnect in the number of students who said they were going to college and the number who enrolled. Gorham says he finds that over the summer, many young people start to worry about going away. The cutback in college coach funding is not the only development that concerns educators and organizations working on postsecondary issues. Sarah Duncan, who works with several schools as part of the University of Chicago’s Network for College Success, points out that the new school performance policy doesn’t include any reference to college enrollment. Instead, there’s a heavy focus on test scores. Recent studies have shown that high school grade-point averages and picking the right college, not test scores, are the most important factors for college success. Meanwhile, Urban Prep still draws criticism — for student turnover. In September 2007, some 178 freshmen started at Urban Prep, yet only 92 of them graduated in June 2011, according to CPS data. Among charter schools that are not alternative schools, Urban Prep has the highest five-year dropout rate, 35 percent, but that figure is still way better than the district’s dropout rate for black male students of 51 percent. Students that start at Urban Prep and transfer to another school where they graduate are not considered dropouts. King acknowledges that Urban Prep is not the right environment for some students. Like many charter schools, Urban Prep has a strict discipline code. Editor’s note: School-by-school information is contained in the attached Excel sheet.